If you are really interested in Russian history, arts and traditions, it is evidentially worth spending in Moscow at least four or five days. This tour will give you a chance to visit not only the most iconic landmarks of the city but also to take a trip to Russian countryside, to feel the atmosphere of Medieval Russia and better understand values of the USSR's epoch. The tour is designed in the way that help you avoid too much walking and minimize your travel expenses at the same time. 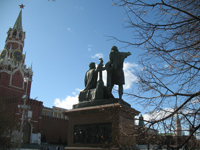 Red Square has always been a venue for markets, festivities, proclamations, parades and shows. St. Basil's Cathedral, the GUM department store, Lenin's tomb and bronze monument to Minin and Pozharsky are its the most prominent sights. Novodevichy Cemetery, the resting place of the famous of the country. The Kremlin, a magnificent fortificated town on the right bank of the Moscow river, served a residence of Russian tsars and hierarchs of the Russian Orthodox Church. Today it has the head office of the Russian president. Our tour includes a visit to some ancient cathedrals of the Kremlin. 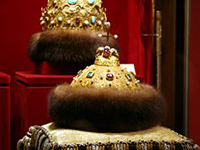 The Armoury Chamber holds the treasures of Russian tsars and emperors including royal regalia and carriges, Faberge Easter eggs and coronation attire. The Moscow Metro Tour invites you to underground chambers stuffed with crystal chandeliers, statues and mosaics and crowded with millions of passengers. The Tretyakov Gallery, the most famous gallery of Russian art in the world, offers a fascinating travel into the world of mysterious beauty and dramatic life stories of Russian artists. 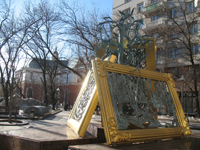 One hour walking tour around the Moscow downtown will help you to absorb your artistic impressions and get more acquainted with everyday life of Muscovites. Our path will lead us to a charming lovers' bridge visited by newly-weds and their friends. We make a stop near the House of the Government, the pre-war residential compound for the most devoted communists of the Stalin's state. You will be able to take photo of the Kremlin from the Patriarchal bridge. Sergiev Posad (Zagorsk) is a small town 35 miles from Moscow, famous for the most honoured Russian Orthodox monastery founded by monk St. Sergiy in the 14th century. The cloister is a unique architectural complex and popular pilgrimage site. There you have a chance to meet pilgrims from all over Russia, try monastic kvas and honey cake, and choose one of numerous matreshka nesting dolls produced in the local factory. Local village one the way to Sergiev Posad is one of many similar settlements in the sleepy Russian countryside. Our stop there gives you opportunity to see how villagers keep their house and how they live their everyday life. VDNKh, or the Exhibition of the People's Economic Achivements, is probably the most bright testament to the glories of the Soviet time. It is a huge park with numerous exhibition and shopping pavilions, fountains and gardens, kids amusements and cyclorama cinema. We also can make a visit to the Space Museum located nearby, if time allows. Kolomenskoye used to be a summer retreat of Russian tsars in the 15th-17th centuries. The estate has a wonderful location on the high bank of the Moscow river, spacious park and apple gardens. Its Ascension Church is the UNESCO World Heritage site. 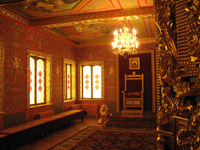 The reconstructed palace of tsar Alexei is a curious labyrinth of living chambers, passages, throne halls and Medieval facilities. We usually take a ride on electric cart to see the Kolomenskoye properties as a whole. Walking tour down Tverskaya Avenue brings you back to our days with a lots of references to the 19th and the 20th centuries. The main street of Moscow bustles with life and still is full of memories. We visit the splendid imperial Eliseev grocery store and come up to the summer terrace of the Ritz for a great view on the Kremlin. You will see the Moscow Mayoralty and hidden living houses which were moved aside from the new line of the street widened in the 1930s.